Like solar panels, solar inverters is also a huge market with stiff competition. The Solar inverter industry has undergone major consolidation. Top solar inverter companies used to be European, as almost 80% of the global solar demand used to come from Europe. However, with the rise of the Japanese and Chinese markets the solar inverter industry is becoming too much fragmented. Listed below are the major solar inverter brands that you can consider buying. Readers are also advised to visit the respective company’s website for more technical details. Read more about Solar Inverters – Tutorial, Manufactures, Prices and Warranties here. SMA Solar is the world’s biggest supplier and manufacturer of solar inverters. Over 3.5 GW of SMA solar inverters are installed globally and the company employs thousands of people globally. SMA Solar faces competition from Chinese companies who have a dominant presence in the growing domestic market of China. However SMA is known as the best brand of solar inverter in the industry for its high quality and reliability. a) Sunny Boy – Sunny Boy inverters are targeted mainly towards the residential market and come in a wide variety of sizes starting from 460 Watts and ending at 10000 Watts. They come with Shade management with OptiTrac Global Technology and H5-Topology Transformer technology, which ensures one of the best yields in the industry. Sunny Boys are available in both transformer and transformerless types and have efficiency ranging between 95-97%. b) Sunny Tower – Sunny Tower is a central inverter with an efficiency of up to 98 %. It has OptiCool temperature management system and a modular design. It is possible to combine Sunny Mini Central with Sunny Boy inverters, thus guaranteeing maximum flexibility in plant design and expansion. c) Sunny Tripower – These are utility grade 3 phase solar inverters with two MPP inputs and a broad input voltage range. It has Optiprotect with self-learning string-failure detection, electronic string fuse and integrable DC surge arrester. It has Bluetooth communication ability and efficiency rating of 98.2%. It comes in the 8-17 kw ranges. d) Sunny Central – These are SMA’s main solar inverters for the solar power plant market. Sunny Centrals have String monitoring, capacity for teamwork and the ability to feed into the medium- voltage power grid. The Sunny Centrals are easy to install – indoors as well as outdoors, with peak efficiency of over 98 %. Sunny Central have power ratings starting from 100 kilowatts and going upto 1.25 MW which makes it one of the biggest solar inverters in the market. They have extended input voltage range up to 1100 V.
Sunny Island – These solar inverters are targeted towards off grid solar power market. These come with a battery pack and the devices form a self-sufficient AC voltage grid. PV and wind energy systems, diesel devices, water or CHP (Combined Heat and Power) can be coupled on the AC side just as conventional 230 Volt consumers. They come in 600 to 5000 Watt power range. They can reach the maximum efficiency level of over 96 %. They have an intelligent battery management for maximum battery life and a 5 year warranty as well. SMA Solar gives a 5 year warranty on its products like most of the other western manufacturers of solar inverters and also gives an extended 10 years solar warranty for an additional payment. Fronius International has production bases in Austria, Czech and Ukraine and the company generated almost 500 million euros of revenue in 2010. Fronius has a Solar Electronics division, under which it manufactures Solar Inverters. Fronius has been involved in photovoltaics since 1992. In 1995 it started selling the “Sunrise” grid-connected solar inverter for generating electricity from solar energy and feeding it into the power grid. a) Fronius IG Series – These are mainly meant of residential solar systems and come in the small single digit kilowatt range. They also have outdoor solar inverters which gives better protection from the weather. Fronius IG comes with integrated DC and AC disconnects. b) Fronius IG Plus Series – These are an enhancement of the IG Series. The products are available in power classes from 3 to 12 kW. There are both 3 phase and single phase inverters. c) Fronius IG TL Series – The Fronius IG TL series is targeted at single-family homes and agricultural or commercial operations. It has the standard system monitoring. The inverters are in the range of 3 kilowatt to 5 kilowatts. d) Fronius CL Series – These are the biggest solar inverters made by Fronius and come in 3 sizes of 36, 48 and 60 kw. These are central inverters. e) Fronius Galvo – designed for self consumption system. f) Fronius Agilo – these are 3 phase central inverters. 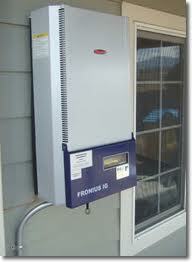 Fronius comes with warranties of 10, 15 and 20 years which makes it distinct from other solar inverter manufacturers. a) 00xi Series – 96.5% CEC efficiency on all 00xi series inverters. The same inverter can be used in 208V, 220V or 240V grid settings. b) 02x Series – 95.5% CEC efficiency on all 02x series inverters and can be used in 208V, 220V or 240V grid settings. c) 02xi Series – 95.5% CEC efficiency on all 02xi series inverters and can be used in 208V, 220V or 240V grid settings. d) XP Series – 96% CEC efficiency, generates fast return on investment, internal 24V power supply with Integrated DC recombiner. e) M Series– The blueplanet 6400M/7600M inverter with integrated Tigo Maximizer Management Unit (MMU). f) TL3 Series – The blueplanet 50.0 TL3 product line is based on the field proven 39.0 TL3 with around 700 MW of installed capacity globally. iii) GT (600V DC) and Context TX (1000 V DC) and Context core XC series ( 1000 V DC) Grid tie inverters for industrial and commercial purposes. b) Luminous sells both grid-tied inverters as well as inverters for off grid solar applications. The 74 % shares of the company was acquired by Schneider Electric for INR 14 billion. c) Hykon India manufactures Grid tie inverters – central, micro and string inverters in the 75-300 KW range. The corporate office is located at Thrissur, with more than ten branches in South India. i) M190 Microinverter – Power Capacity 190 W, Peak Inverter Efficiency 95.5% and Warranty 15 years. ii) M210 Microinverter – Power Capacity 210 W, Peak Inverter Efficiency 96% and Warranty 15 years. iii) D380 Microinverter – Power Capacity 380 W, Peak Inverter Efficiency 95.5% and Warranty 15 years. These inverters use renewable energy and produce power which is useful for home needs and industry, can reduce the usage of traditional energy. These are Eco friendly and have long life compared to incandescent lights. A good article with a nice summary of the various options that buyers have. you havent add anything regarding two important issues that are required for analyze any purchase in India. You have consider only efficiency, and this is one of the important factor to consider for purchase one but not the only one. If you basses your decision only considering this and the price you are completely wrong. range of humidity operation. setting that are recommended by manufacturer for humidity and temperature and when start to have some looses. without those data due the Indian specific weather I dont purchase any the only one that i can recommended for India is SMA by far the best one.You are correct It has the lowest number of failure and a demonstrated highest reliability. and completely ill-advised xantrex. I dont know how you have included in this list, for Indian market. A lot of inverter made by xantrex have an issue with the humidify. You can ask in some solar plan. There is some project with this problem they are losing a lot of generation, in the morning during monsoon, they shut down with 80% of humidity and you are not allow to change the setting if you dont want to lose the warranty. Even in some inverter havent installed a good sensor for control this parameter (some models not all). ask to the manufacturer for those both parameters previously to take a decision. A price of ABB Makes indoor 1000KW inverter of grid connected And 2.5MVA transformer. I bought a Kaco for a customer; it would not work right out of the box. Kaca would not warranty it except if I paid the shipping. I will never use another one.